Last Christmas we finally realized a long-deferred Christmas fantasy. We spent Christmas in a cabin in the woods. The search began with endless hours searching the web for just the right place. We wanted to be on water, in woods, in a certain favorite part of Michigan with lots to do and amazing scenery. We wanted to sit in front of a glowing fireplace with the three dogs and watch the snow fall softly outside our window. Three dogs...that was the catch. "Yes, we'll be bringing one antique dog, one teenage dog and one rambunctious dog in her prime." The rejections piled up. The list of unsuitable places grew. One motel had a suite but Duncan and Emma are very vocal when they play. I didn't want us tossed out on Christmas Day because of noisy dog behavior. Another townhouse was on the main road - meaning I'd be on display in my pajamas more often than I would like, given Arthur's hair-trigger colon. A wonderful rental house was now off limits to dogs because the last young canine visitor had eaten the kitchen counter and several chairs. Finally I found a cabin on a small lake, with a fireplace, within 10 minutes of the town. Now began the breakneck preparation, not only handling the annual holiday checklist, but also preparing to spend 10 days away from the house. We were headed from the city, which gets very little snow, north to Traverse City where 200 inches each winter is common. The cabin was a "bring your own linens" affair. Three dogs, two crates, 3 different kinds of dog food, a laptop computer, the Christmas gifts and Eskimo-like layers of clothing for two people for 10 days - all this and more was coming with us. With normal Christmas preparations crammed into 2 weeks instead of three, I spent the final countdown days washing every article of warm clothing we owned, laying out outfits, packing, washing dogs, etc. It took an hour to load the van. Finally, packed tight as Santa's sleigh with dogs perched on top of the bundles and no rearview visibility at all, we rolled out of the driveway. The cabin's owner sent detailed instructions on how to wind our way to the unmarked road. "The road gets curvy and hilly, the lake is on your right...". For the next 9 days, this became our mantra as we returned from various day trips and navigated back in a Christmas Eve snowstorm. At the end of the curvy road, around numerous turns and perched on the lake on an unmarked road we found it - the genuine imitation log cabin upon which our Christmas Dream rested. So far, so good. Inside, my fantasy fizzled almost immediately. I hadn't seen a white fake leather headboard with buttons in a long time. One chair was partially shredded and the recliner was even scarier. We'd brought along blankets to protect the furniture from any possible dog damage. Now they protected us from the furniture instead. Fake greenery and blinking Christmas lights highlighted the rest of the garage sale reject decor, casting a twitchy glow over the torn carpeting and the pile of wet firewood. I fell onto the sofa in a trance, tears beginning to form. Thinking quickly, Papa produced a box of chocolates. I tore into them as he pointed out the many wonderful features of the cabin. He was enchanted, despite the depressing decor, and quickly set about trying to light the wet wood to make a cheery blaze. I hitched up the dogs for a walk in the quiet snow covered countryside. There was no snow ("the curse of El Nino" the headlines read). This winter wonderland famed for it's luxurious snowfall was grassy green and 45 degrees. The road dead ended in heavily marked private property a block up. We were reduced to walking in circles. Over the next few days, we re-acquainted ourselves with the area, leaving the dogs in their crates in our dreamy little cabin. We visited art galleries, cheese makers, bread bakers, vineyards and quaint shops of every kind. Then we brought the dogs out for lighthouse visits. Evenings we lit fake logs (they work so much better than wet wood) and watched movies on a tiny TV - in between the numerous doggie potty outings. Duncan didn't have to go when Art did, but he was desperate a few minutes later. Emma never wanted to go, so we took her out twice as often fearing she'd explode if we didn't. Christmas Eve we had dinner in town with friends who had also gleefully escaped the 'burbs, then made our way back to the cabin in a blizzard-like snow. We open gifts on Christmas Eve, a tradition left over from the days when 11pm on Christmas Eve was the only time not claimed by one relative or another. The dogs got a stuffed Santa, Reindeer and Christmas Tree, then three Kong toys were loaded up with stinky doggie junk food treats and we all settled in front of the fire to watch a movie. Once all the treats had been pried out of the Kongs, Arthur napped while Duncan and Emma destroyed the stuffed toys. Santa's beard was the first to go. Duncan toyed with the maimed body afterward, rolling on his back and shaking the luckless Santa with his front paws. The limp and beardless Santa was lit from behind by the firelight as his glory days slipped away. It was a less than jolly scene. Meanwhile, Emma was busy with the Reindeer and one stuffed leg was already missing in action. Eventually, what remained of Santa and his pal was cast aside and everyone settled into a deep sleep. The sound began at 2am. As Dr. Seuss would say, it started out low - then it started to GROW. It was the sound of Duncan wailing in his crate. Tossing slippers and a robe over my nightclothes, I snapped a leash on him and hit the door running. Out in the pitch-dark woods, it was so quiet I could hear the snow hitting the ground. I could hear dogs barking way off across the lake. Duncan's whining was especially clear. All those doggie junk treats had wreaked havoc on his system. Duncan doesn't like to be uncomfortable. Duncan likes to make his displeasure known. Now he was hunched over crying loud enough to wake the dead. This went on for 1/2 an hour. I was sure the police would come to see who was being killed. Finally, he resumed a standing position, took two steps and threw up all over the driveway. Thinking the worst must be over, I headed for the door. Suddenly I was spinning around, my slippers tractionless in the fresh snow. Duncan had rediscovered his treats. Surely we weren't going to leave a warm pile of goodies like this just lying about. He was intent on re-ingesting his Christmas dinner. The strength of a 25-pound dog on a mission is amazing. I grabbed onto a tree to keep from being dragged back to the vomit buffet. It took all my energy to break free and toss Duncan inside. I knew the same scene would be repeated until the goodie pile was gone. Now, at 2:30 on Christmas morning, I was alone with my thoughts, a roll of paper toweling, a trash bag and a puddle of slightly used dog treats as snow fell gently on my robe. I staggered back inside, put Duncan back in his crate and was almost back asleep when the wails began again. By dawn I was in no mood for Christmas cheer. On Christmas Day, after sleeping late to make up for the great vomit adventure, we packed the dogs in the van and headed to the tip of the Leelanau Peninsula to Grand Traverse Lighthouse. Papa wanted pictures of the lighthouse in the snow. As we neared the tip of the Peninsula, we were reminded of the temperate weather that makes it a prime spot for cherry orchards. There was no snow. But, I had another mission to accomplish. Swerving through the empty parking lot, led by my team of hearty Cockers, we made our way past the lighthouse to "Tristan's Path". Tristan discovered this narrow pass down to beach years ago and Arthur always remembers the exact spot. We now stood as far out in Lake Michigan as we could get. Now we could wave to Andrea and her pack. Andrea is another dogmama living in Wisconsin, just a few hundred miles due west. We've never met in person but we are kindred spirits nonetheless. I faced into the wind coming off the lake and shouted holiday greetings and waved - just as I told her I would. The dogs thought I was insane. That afternoon when we returned to the cabin, I took the dogs for a spin around the yard. Arthur lagged behind, Emma dashed ahead and Duncan wrapped the leash around my legs. It was slow going. Suddenly, Emma froze. She fell on her side on the ground and began to vibrate. A sinking feeling overtook me. Both Earnest and Tristan were seizure dogs. Now, it seemed poor Emma was "down" for the first time. Before I could kneel beside her, Duncan scurried over and buried his nose in the same patch of snow. His head never came back up but his body was quivering. I yanked him away and Emma sprang to her feet and stuck her muzzle into the snow. Now the answer became clear - deer tracks. These suburban dogs were in a deer-induced delirium. The scent took them completely by surprise as they dug their nostrils deep into each hoof print. They seemed drugged by the newness of it all. Arthur sauntered up to see what all the fuss was about. Now Arthur had never smelled deer before either, but he knew just what to do. He stepped up beside the deer track and filled the imprint in the snow with urine. There. No further exploration needed. The track was well and truly marked. The others looked on as though he'd defaced a national monument. Still, they had to admit that the track now possessed an unmistakably familiar odor. Content that the excitement had been properly contained, Arthur marched on. Subsequent tracks were explored with considerably less gusto. The spell was broken. Late that night, as the dogs lay snoozing by the fire, I hooked up the laptop and checked my e-mail for the first time in a week. Dogs and their people from around the world had sent me e-mail greetings. Some said they'd been singing my carols with their pack. Some told me about their dogs. All made me smile. 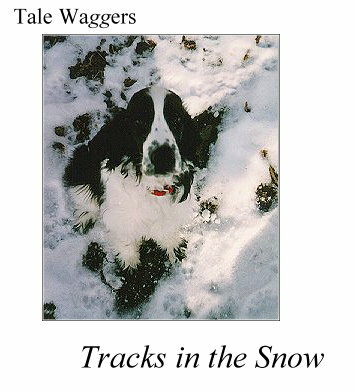 Then I realized these too were tracks in the snow - a link to people (and dogs) I'd never met and places I'd never been. Now I understood what Emma's excitement was all about - the joy of being part of some larger whole ...finding and leaving tracks in the snow.